The policy of our government may be unstated, but it is crystal clear: The United States will no longer seek peace. Whether you agree or not, under President Trump, the United States is not pretending anything. We have declared unambiguously that we care only about Israel’s interests — or, to be more accurate, Israel’s interests as understood by the conservative Likud party — and that we no longer have any concern for Palestinian rights, Palestinian lives or the eventual creation of a Palestinian state. Monday marked the moment when the policy of the United States government toward the Israeli-Palestinian conflict lost all complexity, all ambiguity and all nuance. On Monday, we were confronted with two sets of pictures. On one side, thousands of Palestinians gathering at the Gaza border to protest are being shot down by Israeli snipers. As I write, at least 43 people have been killed and more than 2,000 wounded, according to the Gaza Health Ministry; those numbers will undoubtedly rise. On the other side, representatives of the Trump administration, including Ivanka Trump, Jared Kushner, some Republican donors and a couple of evangelical megachurch pastors who have said vile, bigoted things about Islam and Muslims, are celebrating the opening of the U.S. Embassy in Jerusalem. “Jerusalem returns the love to Trump,” writes Jerusalem Mayor Nir Bakat before official opening of new US embassy. 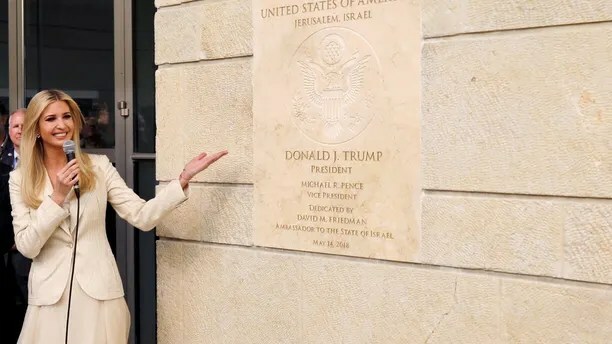 So thrilled was the mayor of Jerusalem that Donald Trump had recognized the city as the capital of Israel that he decided a fitting tribute of thanks –—naming a roundabout in honor of the US president. “Jerusalem returns the love to Trump,” Nir Barkat wrote on Facebook on Tuesday, showing a picture of the traffic circle at the site where the new American embassy is due to be opened next week. “We have decided that the square adjacent to the embassy in the capital will be called ‘United States Square — in honor of President Trump’,” he said in the Hebrew-language post. Netanyahu has convinced Trump that leaving the Iran deal protects Israel. But the US walk-out means a full-on Israel-Iran war in Syria now becomes far more likely. The entire world watched as President Donald Trump announced America’s exit from the Iran nuclear deal, and his re-imposition of the full range of sanctions on Iran. While the British, French, and German governments made clear their strong preference that the US maintain the JCPOA, Prime Minister Benjamin Netanyahu was not shy in his efforts to convince the White House of the wisdom of his opposite position. The United States opens its new embassy in Jerusalem on May 14, a move that has delighted Israel and infuriated Palestinians. In 1947 the UN recognized that Jerusalem had special status and proposed international rule for the city, along with nearby Bethlehem, as a “corpus separatum” to be administered by the United Nations. That never happened. On Monday, road signs directing traffic there went up around the neighborhood where the US Embassy will be situated, and next week’s opening ceremony is timed to coincide with Israel’s 70th anniversary. The initiative was driven by President Donald Trump, after he broke last year with decades of US policy by recognizing Jerusalem as the capital of Israel. Israel’s prime minister, Benjamin Netanyahu, celebrated Trump’s decision, but the move upset the Arab world and Western allies. Palestinian President Mahmoud Abbas called it a “slap in the face” and said Washington could no longer be regarded as an honest broker in any peace talks with Israel. The US Embassy move to Jerusalem will cause 450 elderly immigrants to lose their homes, and the Knesset doesn’t have a solution yet. The Diplomat Hotel, which is owned by the US and is located next door to the Jerusalem consulate that will become the embassy in 2020, is being leased as housing for elderly immigrants. But the building is slated to become part of the embassy, forcing the residents to find other housing. At a heated discussion at the Immigration, Absorption and Diaspora Affairs Committee on Monday, Ksenia Svetlova of the left-wing Zionist Union blasted the committee for not moving quickly enough to find a solution for the residents.